INTRODUCTION: Hepatic sickness is a serious problem for human health. The researchers are interested in using medicinal plants including barberry to cure many of these sicknesses. In this study, the effect of hydroalcoholic extract of Berberis vulgaris leaf on hepatic protection was assessed in rats. MATERIALS AND METHODS: Forty healthy male Wistar rats were divided randomly into five groups (n = 8): Group 1 (healthy control), intraperitoneal injection of olive oil; Group 2 (hepatotoxic control), intraperitoneal injection of carbon tetrachloride and daily gavage of distilled water; and testing groups, intraperitoneal injection of carbon tetrachloride along with daily gavage of B. vulgaris leaf extract 40, 80, and 120 mg/kg of weight, respectively. After 6 weeks, the following were checked: enzyme level of alanine aminotransferase (ALT), aspartate aminotransferase (AST), alkaline phosphatase (ALP), as well as serum level of total protein (TP), albumin (ALB), and histopathological status of the liver. RESULTS: The level of AST, ALP, and ALT was increased to 109 (IU/L), 95(IU/L), and 71(IU/L), respectively, in hepatotoxic control group than healthy control group, and there was a decrease of 0.86 (g/dl) and 0.04 (g/dl) in TP and ALB levels, respectively. The B. vulgaris extract in every three doses caused a significant decrease in hepatic enzymes level. However, the TP had a significant increase in 80 and 120 mg/kg of body weight. Regarding ALB, there was no significant difference among these groups. The histopathological results were not conformed to biochemical findings. CONCLUSION: Using the appropriate dose of B. vulgaris leaf extract can help the improvement of laboratory symptoms of fatty liver. 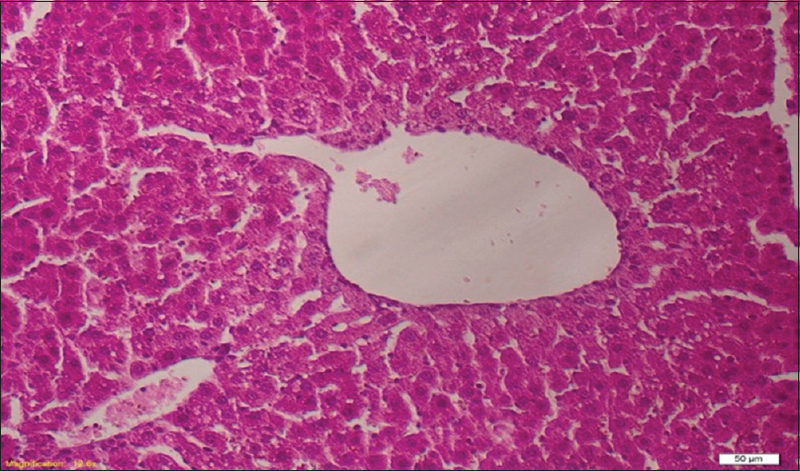 Liver is the main organ in metabolism, secretion, and disposal of materials and has a vital role in maintaining, implementing, and regulating homeostasis in the body and is involved in most of the biochemical pathways for growth, defending against diseases, nutrition supply, energy production, and reproduction. Many of the scholars believe that liver is in relation with the creation of all illnesses or lack of proper functioning of various organs of the body. One of the primary and main functions of liver is to help the metabolism of digestible ingredients including foods, food supplements, alcohol, and most medicines. Medications can cause a variety of liver damages including mild abnormal function such as increased activity of serum aminotransferases to severe organ damage such as hepatocellular necrosis or intraperitoneal cholestasis. With liver damage, serum levels of many biochemical markers such as alanine aminotransferase (ALT), aspartate aminotransferase (AST), alkaline phosphatase (ALP), cholesterol, bilirubin, triglyceride, and gamma-glutamyl transferase increase, and albumin (ALB) synthesis and total protein (TP) decrease. Despite the great progress of modern medicine, there exist little synthetic drugs to treat liver disorders. However, it is claimed that there are many plants which have useful activity in the treatment of liver disorders., Berberis vulgaris contains berberine drug, and other alkaloids such as berbamine, columbamine, malic acid, and palmethine. The fruit, leaves, and stem of this plant are medically consumed, of which the following can be named: protecting the heart and liver and microbial properties. B. vulgaris is one of the few herbs in which root, skin, stem, leaves, flower, and fruit are used differently for food, medicine, and industry. This plant is located in different parts of the world and has a long history in traditional medicine., Berberine is the most important barberry-segregated alkaloid that has different therapeutic properties such as antimicrobial properties, antitumor, and reducing nervous disorders, and it is also effective in preventing coronary artery disease. Bran and root of B. vulgaris contain some chemical compounds such as isoquinoline and alkaloids, and the leaves contain a lot of Vitamin C., Therefore, with respect to the many evidence which exist for different properties of B. vulgaris plant as well as its liver protection effects, and on the other hand production of medicinal products from plants is increasing, the main issue of the present research is evaluating the liver protection possible effect of B. vulgaris leaf extract on liver damages in hepatotoxic rats. This project is an empirical study that was done in 2016 to determine the amount of liver protection effect of B. vulgaris leaf on liver damages, caused by carbon tetrachloride, in male adult rats. The sample included forty Wistar healthy male adult rats (with a weight range of 200 ± 20 g), which were divided randomly into five equal groups (n = 8). Group 1 (healthy control): In this group, the intraperitoneal injection of olive oil was done twice weekly for 6 weeks (1 ml/kg of body weight), and simultaneously with prescription of the extract to other test groups, the daily gavage of distilled water (1 ml/kg of body weight) was done for this group. Group 2 (hepatotoxic control): In this group, the intraperitoneal injection of carbon tetrachloride solution in olive oil (50:50 V/V) was done twice weekly (1 ml/kg of body weight), and simultaneously with prescription of the extract to other test groups, the daily gavage of distilled water (1 ml/kg of body weight) was also done for this group. Test groups 1, 2, and 3: Like hepatotoxic control group, the intraperitoneal injection of carbon tetrachloride solution and olive oil was done twice weekly for 6 weeks. The gavage of B. vulgaris leaf extract was done daily for the Groups 3, 4, and 5 at doses of 40, 80, and 120 mg/kg of body weight, respectively. In all groups, the rats were weighed biweekly, and based on the new weight, the amount of carbon tetrachloride and B. vulgaris extract was calculated and used. B. vulgaris leaf was gathered from Tang-e Sorkh region in Shiraz–Yasuj road, and after the confirmation of plant genus and species by the Ministry of Agriculture Jihad, the leaves were carefully washed, dried, and ground. The prepared powder was soaked in 70% ethanol and placed in a shaker device for 48 h in a laboratory environment. After 48 h, it was filtrated. The resulting solution was relatively condensed by a rotary machine (Hydolph 4000 model) with a pressure of 40–72 mbar and 100 RPM round, and then it was completely dried in the incubator. The obtained extract was weighed for the needed doses and kept in a separate dish inside the freezer, and in a week, the desired amount of extract was well dissolved in distilled water and ready for use. After 6 weeks and 24 h after the last treatment, the rats were anesthetized with diethyl ether, and blood collection was done from their heart. After blood collection with proper method, they became medullary and were dissected; the liver tissue was removed and fixed in 10% formalin until performing pathologic tests. The obtained bloods after coagulation were put into a centrifuge machine with 3000 rounds/min for 5 min until their serum was separated. The diagnostic kits of Pars-Azmoon were used for the measurement of ALP, AST, and ALT liver enzymes as well as TP concentration and ALB. The obtained results were measured through one-way ANOVA at a significant level of P < 0.05. The activity of AST, ALT, and ALP enzymes in toxicant group with carbon tetrachloride increased to 109 (IU/L), 95 (IU/L), and 71 (IU/L), respectively, compared to healthy control group, and a decrease of 0.86 (g/dl) and 0.04 (g/dl) was observed in serum level of TP and ALB, respectively [Table 1]. In all test groups 1, 2, and 3 that received the B. vulgaris leaf extract and were toxicant simultaneously with carbon tetrachloride, the activity of AST, ALT, and ALP enzymes decreased significantly (P < 0.05). Also, based on the obtained results, the activity of AST and ALT enzymes in the test Group 3 and the activity of ALP enzyme in the test Group 1 showed a better decrease compared to other test groups [Table 1]. Regarding the serum proteins, the results showed that in P < 0.05 level, the B. vulgaris leaf extract did not show a significant increase in TP concentration in the test group 1 compared to toxicant group; however, it could affect the TP amount in test groups 3 and 4 and increase it (P < 0.05) compared to the toxicant group. Regarding ALB, the results showed that B. vulgaris leaf extract could not affect the amount of this factor in none of the test groups, and this difference was not statistically significant (P > 0.05) [Table 1]. 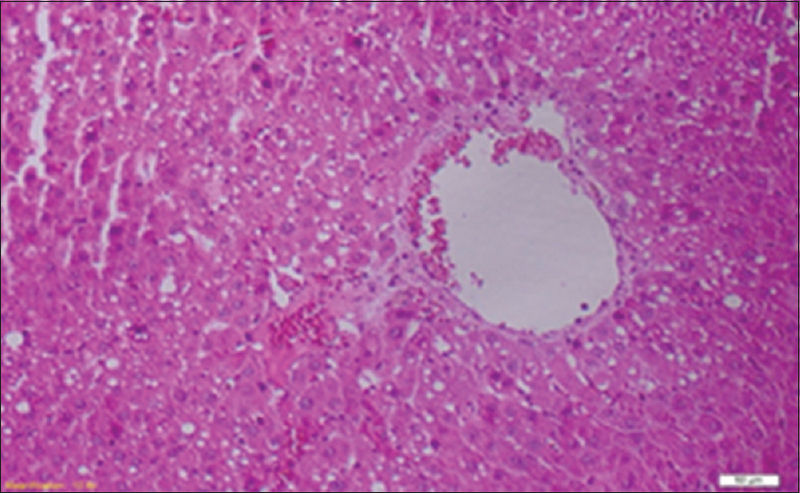 The histopathological results of liver tissue of rats showed that in all test groups 1, 2, and 3, the intravenous congestion, glycogen reduction, and the perturbation of the classical lobule structure of liver were observed. It means that B. vulgaris leaf extract could not decrease the liver damages caused by carbon tetrachloride toxicity compared to the hepatotoxic control group [Figure 1]. [Table 1] shows the effect of hydroalcoholic extract of B. vulgaris leaf on liver enzymes ALT, AST, ALP, total protein and albumin in serum of studying groups. Liver is an important organ and a central one for many of the metabolic functions of the body, decomposition of toxic and waste substances, and disposal of harmful substances from the body., Liver illnesses are still the serious problem of human health. Making active oxygen species is an unavoidable result in aerobic organisms, and their removal is done at a basic level and with regard to the useful physiological functions and their harmful effects. This sensitive balance is for retaining the intracellular redox state which has an important role in optimizing cell functions. Excessive accumulation of free radicals or the body's inability to remove them causes the relocation of redox equilibrium for creating oxidation states in the body. One of the compounds that cause the production of free radicals is carbon tetrachloride. Connecting free radicals to hepatocyte membranes causes membrane and necrosis damage; therefore, the activity of ALP, ALT, and AST enzymes increases, and this state causes the releasing of the enzymes to the bloodstream which are naturally in the cytosol of the cell; accordingly, in order to detect liver damages, the serum level of ALP, ALT, and AST enzymes is used extensively. Eidi et al. proved the effects of barberry on liver protection in 2011 in a study regarding the effects of alcoholic extract of mountain grainy barberry on liver protection in toxicity caused by treatment with carbon tetrachloride in male rats and related this effect to its antioxidant compounds. Furthermore, Majd et al. confirmed the anticancer and antioxidant effects of Zarafshani barberry in 2008. As there exist so many studies in confirmation of the effects of plants that have antioxidant properties on the protection of liver tissue and no study has been done so far on the effects of B. vulgaris leaf on the protection of liver, in the present study, the effects of B. vulgaris leaf on the protection of liver against the liver damage caused by carbon tetrachloride were studied and reviewed in rats. The present study showed that in toxicant rats by carbon tetrachloride in comparison with other groups, the amount of liver damage index enzymes (ALT, AST, and ALP) increased and the serum level of ALB and TP decreased, which is due to the destruction of liver cells by carbon tetrachloride and absence of preservatives. Based on the obtained results from this study, receiving the B. vulgaris leaf extract causes the significant decrease in the serum level of ALT, AST, and ALP enzymes compared to the hepatotoxic control group; also, the results showed that the treatment of toxicant rats with B. vulgaris leaf extract causes the significant increase in the serum level of TP in the doses of 80 and 120 mg/kg of body weight and significant decrease in the lipid peroxidation in the dose of 120 mg/kg of body weight, which is probably indicating antioxidant properties of B. vulgaris leaf extract. In none of the test groups, the prescription of B. vulgaris leaf extract created a significant change in ALB level compared to the toxicant group [Table 1]. 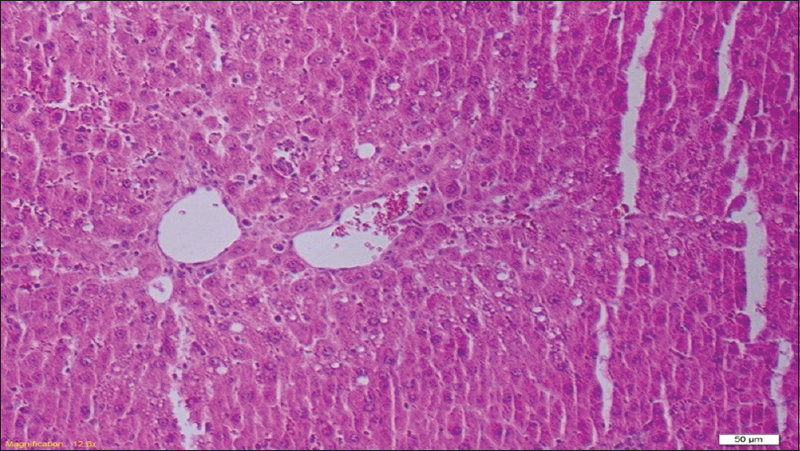 The results of histology studies using taking photo by a microscope showed that B. vulgaris extract could not cure the liver tissue of tested rats [Figure 1], [Figure 2], [Figure 3], [Figure 4], [Figure 5]. As it was shown in this study, B. vulgaris leaf extract could not change the amount of ALB significantly; however, it caused a significant decrease in the activity of ALT, AST, and ALP enzymes in a manner that could decrease the serum level of these enzymes. Furthermore, it caused the increase of serum level amount of TP that it may be due to the antioxidant compound in this plant. Based on the results of this study, it is likely that B. vulgaris leaf extract, because of its antioxidant properties, could apply somewhat its liver protection affects against the toxicity caused by carbon tetrachloride. Therefore, an exclusive review is recommended on the effective antioxidant compounds of B. vulgaris leaf extract and also the exact mechanism of the effect of those effective ingredients in this protection effect. The study was supported by Yasuj University of Medical Sciences. Adesanoye OA, Farombi EO. Hepatoprotective effects of Vernonia amygdalina (astereaceae) in rats treated with carbon tetrachloride. Exp Toxicol Pathol 2010;62:197-206. Chatterjee M, Sarkar K, Sil PC. Herbal (Phyllanthus niruri) protein isolate protects liver from nimesulide induced oxidative stress. Pathophysiology 2006;13:95-102. Ahmed B, Alam T, Khan SA. Hepatoprotective activity of Luffa echinata fruits. J Ethnopharmacol 2001;76:187-9. Ramachandra Setty S, Quereshi AA, Viswanath Swamy AH, Patil T, Prakash T, Prabhu K, et al. Hepatoprotective activity of Calotropis procera flowers against paracetamol-induced hepatic injury in rats. Fitoterapia 2007;78:451-4. Liang D1, Zhou Q Faure P, Lafond JL. Measurement of plasma sulfhydryl and carbonyl groups as a possible indicator of protein oxidation. In: Analysis of Free Radicals in Biological Systems. Basel: Birkhauser; 1995. Liang D, Zhou Q, Gong W, Wang Y, Nie Z, He H, et al. Studies on the antioxidant and hepatoprotective activities of polysaccharides from Talinum triangulare. J Ethnopharmacol 2011;136:316-21. Ledda-Columbano GM, Coni P, Curto M, Giacomini L, Faa G, Oliverio S, et al. 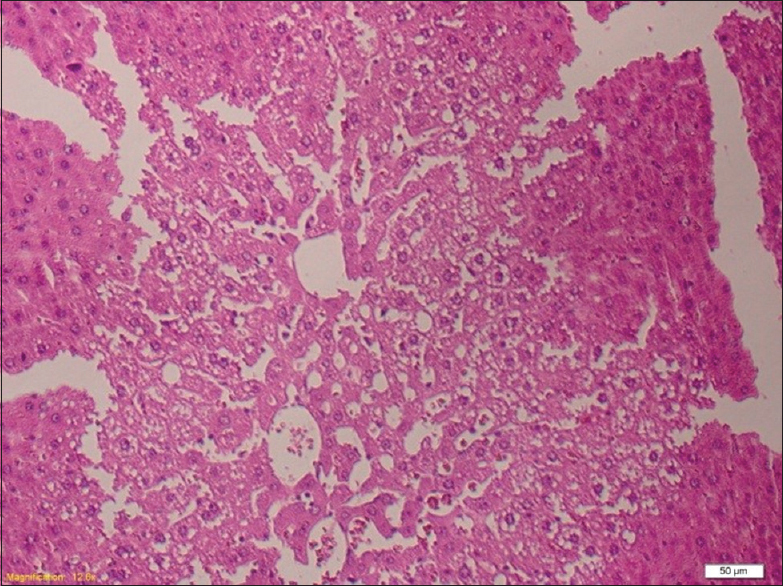 Induction of two different modes of cell death, apoptosis and necrosis, in rat liver after a single dose of thioacetamide. Am J Pathol 1991;139:1099-109. Ortiz LM, Lombardi P, Tillhon M, Scovassi AI. Berberine, an epiphany against cancer. Molecules 2014;19:12349-67. Vuddanda PR, Chakraborty S, Singh S. Berberine: A potential phytochemical with multispectrum therapeutic activities. Expert Opin Investig Drugs 2010;19:1297-307. Derosa G, Maffioli P, Cicero AF. Berberine on metabolic and cardiovascular risk factors: An analysis from preclinical evidences to clinical trials. Expert Opin Biol Ther 2012;12:1113-24. Elon Kashkouli R, Salehzadeh H, Najafi SS, Kazam HA, Chelate HA, Sadati A. Berberis vulgaris fruit extract on blood pressure and weight of patients with nonalcoholic fatty liver. J Res Dev Nurs Midwifery Spec Semin Sixth Nurse Midwives Res 2013;10:21-27. Ashraf H, Heidari R, Nejati V, Ilkhanipoo M. Preventive effect of Berberis Integerrima on the serum levels of glucose and lipids in streptozotocin (STZ)-induced diabetes in rats. J Fasa Univ Med Sci 2012;2:148-55. Heibatollah S, Reza NM, Izadpanah G, Sohailla S. Hepatoprotective effect of Cichorium intybus on CCl4-induced liver damage in rats. Afr J Biochem Res 2008;2:141-4. Sadeghi H, Yazdanparast R. Effect of Dendrostellera lessertii on the intracellular alkaline phosphatase activity of four human cancer cell lines. J Ethnopharmacol 2003;86:11-4. Bell AW. Lipid metabolism in liver and selected tissues and in the whole body of ruminant animals. Prog Lipid Res 1979;18:117-64. Wolf PL. Biochemical diagnosis of liver disease. Indian J Clin Biochem 1999;14:59-90. Guntupalli M, Chandana V, Hpangadan PP, Annie Shirwaikar I. Hepa to protective effects of rebinding, a major constituent of Rubia cordifolia Linn. J Ethnopharmacol 2006;103:484-90. Sachdev S, Davies KJ. Production, detection, and adaptive responses to free radicals in exercise. Free Radic Biol Med 2008;44:215-23. Fisher-Wellman K, Bloomer RJ. Acute exercise and oxidative stress: A 30 year history. Dyn Med 2009;8:1. Ahmad A, Pillai KK, Najmi AK, Ahmad SJ, Pal SN, Balani DK, et al. Evaluation of hepatoprotective potential of jigrine post-treatment against thioacetamide induced hepatic damage. J Ethnopharmacol 2002;79:35-41. Drotman RB, Lawhorn GT. Serum enzymes as indicators of chemically induced liver damage. Drug Chem Toxicol 1978;1:163-71. Eidi A, Zarin Ghalam J, Rezazade SH, Adeli R. Hepatoprotective effect of Berberis vulgaris L. Extract onCCl4-induced toxicity in rats. KMJ 2011;16:169-73. Majd A, Mehrabian S, Mostafai H, Rahmani H. Antioxidantand anticancer effect of aqueous extract of Berberis integerrima. J Biol Sci 2008;1:31-8. Amouoghli Tabrizi B, Mohajeri D. Protective effect of edible turmeric (Curcuma longa Linn.) 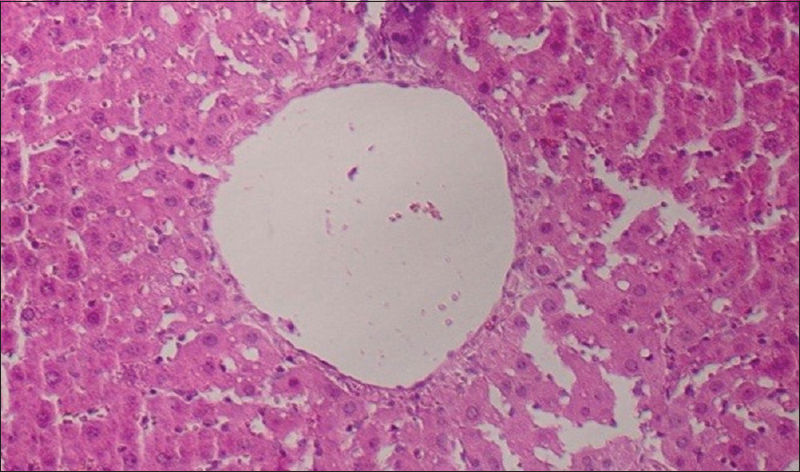 powder on early hepatic injury in diabetic rats. Feyz J Kashan Univ Med Sci 2010;14:190-9.